I’ve said it before, and I’ll probably say it another thousand times. 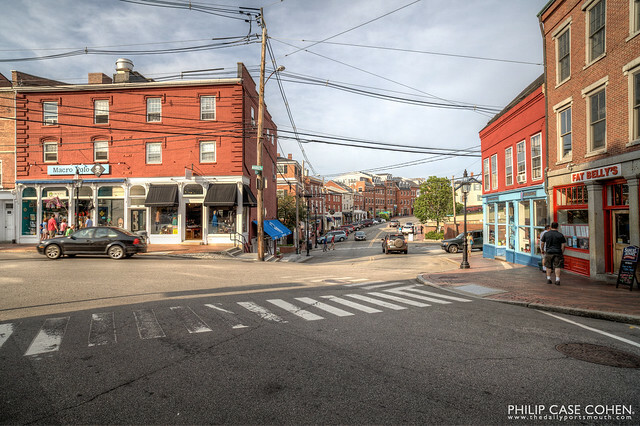 The curve of the buildings along Bow Street is a beautiful thing, demonstrating the curve in the Piscataqua River as seen from land. As captured in this image, Market Street and Bow Street are busy places, usually the most fun places to be during warmer weather – evidenced by the steady flow of pedestrians. I loved the lighting and the summery mood in this image, and enjoyed seeing peoples’ reaction to the cars as they navigate the streets. Portsmouth is great for people watching all times of year, but especially when the people start coming out of the woodwork in the spring months.